Game uses the deck without Joker (52 cards). The purpose of the game is to move all cards into the foundation columns. The foundation column can be built up by same suit from Ace. The 8 tableau columns are build down by alternate color. Only the correct sequence of cards can be moved between tableau columns. Any card may be moved into empty tableau spaces. 1 card(s) are moved from the stock to the waste pile at a time. The top card of the waste pile is available for play. There is no redeal. 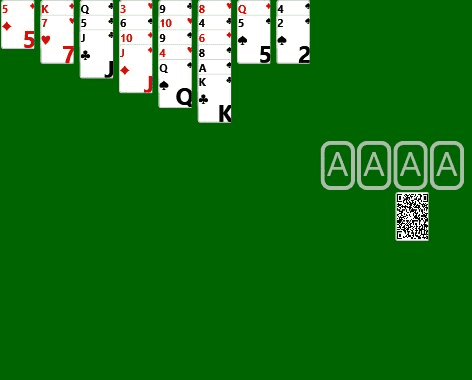 The last two piles at start of the game contain two cards each. Can be used as free cells for one card each. Scoring: Standard. Move card to Tableau: +5. Move card to Foundation: +10. Turn over Tableau card: +5. Move card from Foundation: -15. You lose two points every 10 seconds and there is a bonus for a fast finish.